I live! And I have a new fandom I am gushing over. So I thought I would review the first season with my loves and (of course) my nitpicks. Miraculous Ladybug (or alternatively, Miraculous: Tales of Ladybug and Chat Noir) is a French cartoon, the story of two teenage superheroes, Marinette and Adrien, also known as Ladybug and Chat Noir, respectively. They fight to protect Paris–yes, that Paris–from the corruption of Hawkmoth and his akuma, using the power of good luck and bad luck (three guesses as to who has which power, and the first two don’t count). Most of the background plots focus on the love square with our heroes…which unknown to them, only involves two people. Because they don’t know who each other is. Ugh, the love square. It has made this fandom sickeningly sweet and fluffy (like give you cavities sweet), or heartbreaking angst (so much character death, and no one ever tags it properly). And yet, I love it. The two people in question are so oblivious in the show and yet heartsick over it, even if I differ from canon and think Adrien has at least a clue about how Marinette feels about him. She’s just too obvious, and he’s too flirty for it to be coincidence. Regardless of your stance, you just want to shove them in a closet when their powers are fading and get the reveal over with so there can be fluff! Considering how old and cliche this trope is, the writers still have you sucked into this show with it. That’s good writing. …Not perfect writing, mind you. They have been following the monster-of-the-week formula for the most part, which worked well to establish the world regardless of when you start watching. But we’re running out of side characters to turn into akuma, and the last few episodes introduced some plot hooks that are too interesting to not flesh out. I hope they start easing out of their formulas to follow up on them. Otherwise, it’s going to grow stale very quickly. I can only take so much obliviousness and teen drama before I want story to pay off. The characters themselves are actually in balance for the majority, which is always a nice change. The various side characters are built well without trying to compete with the main characters, while the two leads are multi-faceted without getting cluttered or overly perfect. The superhero aspect just fuels this, since it allows the hidden selves and subtle traits of the main characters to show themselves. Awkward, overly excitable Marinette becomes confident and focused as Ladybug, but her kindness and cleverness shine through in either form. Cool and slightly aloof Adrien as Chat Noir is showboating and flirty (err, flirtier, yes Adrien, I’ve got all those little winks of yours), but his loyalty and sincerity are undeniable regardless of which one you are dealing with. The traits are there in both forms, but the hero-forms just bring them into focus to let the audience appreciate them better. Aesthetically, there is so much about this show that is so pretty. Seriously, so pretty. All the little details in the background are so perfect, and you almost see a new detail every time. The animation is smooth, and while graceful, they aren’t too overly exaggerated. I know the 3-D aspect annoyed fans who were following the creation process, but I can’t find it in me to care. I love all variations of animations equally as long as it is pleasing to the eye, and this style serves the show just fine. There are some quirks I could do without, though. The two kwami (the transformation creatures that remind me a lot of PreCure) could have used a little refining. Plagg is fine, Tikki just seems really dumpy looking to me sometimes, depending on what they are doing with her. 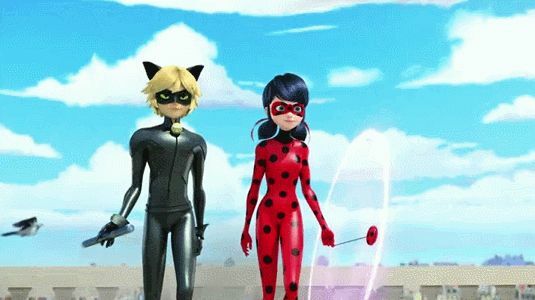 Similarly, let’s compare Chat Noir and Ladybug’s costumes, shall we? Look at how intricate his is! He is very clearly built to be a tank, the front line fighter. He’s also got the stealth aspect. To put it simply, Chat is meant to be in the thick of things, and his signature attack and weapon reflect this. (Okay, the bell is just silly since as far as I can tell it doesn’t even ring, but it amuses me, so I don’t complain.) Now let’s look at Ladybug. Very streamlined and simple (actually too simple to me, but we’ll get there, trust me), the yo-yo can attach to her costume. She is the mage/cleric/ranged to Chat’s tank. So…why is she in eye-catching, distraction costuming? I understand wanting her to look like a ladybug, but the all-over polka dots is an eyesore. Even ladybugs only have those on their backs, and some care definitely could have been needed. Hopefully there’s a costume edit in her future. This entry was posted on Saturday, April 9th, 2016 at 8:17 PM	and tagged with adrien, angst, bad costume, character death, characters, chat noir, fantasy, fluff, ladybug, marinette, miraculous, oh so pretty, review, setting, superheroes, sweet, this fandom, TV review, USE TAGS RIGHT! and posted in Reviews, TV Show Review. You can follow any responses to this entry through the RSS 2.0 feed.